Space for Transparency This blog by Transparency International provides an independent and informed viewpoint on corruption. It gives a space to start a worldwide conversation on possible solutions to overcome corruption, and on governance, transparency and accountability. Will Britain tackle tax evasion? Pressure on what are alternatively called ‘offshore havens’, ‘tax havens305’ or ‘secrecy jurisdictions’ is reaching an unprecedented level. There are more than fifty such havens world wide, and governments are finally coming around to the idea voiced by activists that tougher regulation is needed. The economic crisis has lent urgency to the cause. Britain’s Chancellor of the Exchequer, George Osborne, is searching for new sources of revenue. Meanwhile, there are calls for some form of wealth tax306 in both France and the UK. So when it comes to the tax dodging that can undermine these budget-balancing efforts, we need to know what is legal and illegal, what is offshore and onshore. Nine of the fifty tax havens are nominally under the sovereignty of the Crown or the UK government. They constitute a major responsibility for Britain, one which is largely avoided. The Bank of International Settlements307 reported in 2009 that total funds in all the UK connected jurisdictions accounted for 55 per cent of the global total of offshore money – at that time estimated by the Bank at $ 6.5 trillion (though other estimates are much higher). This year they issued a report showing that this total figure had not shifted308 much since the G20 promised to “end bank secrecy309”. Recent analyses, notably from Global Financial Integrity310 , have shown how these deposits mix the fruits of bribery, organised crime and ‘mispricing’311 by companies trading internationally. Do havens hold funds for unidentified people and companies? The nine UK Offshore Financial Centres all score badly in Christian Aid’s Financial Secrecy Index312. However, a 2011 World Bank report The Puppet Masters313 found ‘Trust and Company Service Providers’ who form companies in OECD countries actually carry out less intensive security checks (“due diligence”) than those who form companies in offshore centres. . In other words, much of the obscurity around who owns assets is caused in wealthy nations, not the tax havens. In the same vein, the recent Tax Justice Network report by James Henry (The Price of Offshore314) showed that complex corporate structures, designed to hide the real beneficial owners, are vehicles with many tentacles and are as likely to have one based in London or New York as in the Caribbean. In this case the focus of change has to be on dismantling the legality of such structures. The ownership of assets, therefore, is more likely to be obscured before it reaches the tax haven, with the US particularly at fault. Do ‘offshore’ tax regimes attract individuals and companies who would otherwise pay tax in the other countries where they operate? 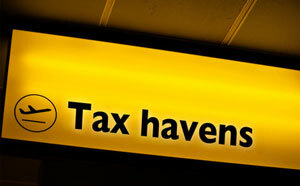 Barclays Bank informed a House of Commons Committee in 2009 that it had 315 subsidiaries in various tax havens. The British Virgin Islands hosts 800,000 ‘international business companies’ (a specific type of company). The Caymans host 18,000 ‘business companies’ many of them Foreign Sales Corporations – a major corporate tax dodging vehicle for US companies. A survey carried out by Deloitte’s for the Foot report, commissioned by the UK Government in 2009, found that these tax regimes were often characterised by ‘the absence or near absence of certain forms of taxation’. Ironically, it seems likely that the long awaited attack on corruptly gained funds, deposited ‘offshore’, will be sustained by an attack on the more effective taxation of major international companies. But progress will not be uniform: in 2008 Barack Obama vowed315 to dismantle the tax regime US companies benefit from in the Caymans. In his 2012 campaign there has barely been a reference to such an obvious loophole. The G20316 needs to sustain its attack on these issues. Share and enjoy: These icons link to social bookmarking sites where readers can share and discover new web pages. ← Is the Public watching its Public Officials? This blog by Transparency International provides an independent and informed viewpoint on corruption. It gives a space to start a worldwide conversation on possible solutions to overcome corruption, and on governance, transparency and accountability. You can email us at press "at" transparency.org. Feel free to leave a comment on posts that interest you, too. © 2009-2013, Transparency International. All rights reserved.